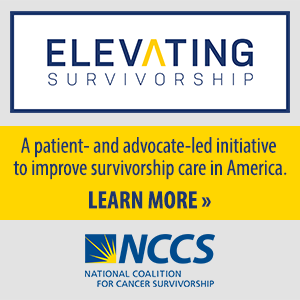 Advocacy – The Cornerstone of Cancer Survivorship – In cancer survivorship, advocacy is a continuum. It may begin at the personal level, but as the survivorship trajectory changes, self-advocacy efforts may broaden to encompass first group or organization advocacy, and later may move to public advocacy efforts. “The Law of Intended Consequences: Did the Americans with Disabilities Act Amendments Act Make It Easier for Cancer Survivors to Prove Disability Status?” (reprinted from the New York University Annual Survey of American Law, Vol. 68, Issue 4, 2014) addresses critical questions related to the impact and interpretation of the ADA and disability status for cancer survivors. The article was authored by NCCS founding chair Barbara Hoffman. As many of you know from experience, people with cancer and their family members are at increased risk for anxiety, depression, and elevated stress as a result of managing life with cancer. This newly released report explains why psychosocial health care is important and why the health care system should recognize these needs and connect patients to the right services. The Institute of Medicine provides unbiased, evidence-based, and authoritative information and advice concerning health and science policy to policy-makers, professionals, leaders in every sector of society, and the public at large. Helps you to manage your illness, treatments, and health. Americans should be able to count on receiving care that meets their needs and is based on the best scientific knowledge. Yet there is strong evidence that this frequently is not the case.1 Crucial reports from disciplined review bodies document the scale and gravity of the problems. Quality problems are everywhere, affecting many patients. Between the health care we have and the care we could have lies not just a gap, but a chasm. The Committee on the Quality of Health Care in America was formed in June 1998 and charged with developing a strategy that would result in a substantial improvement in the quality of health care over the next 10 years. In carrying out this charge, the committee commissioned a detailed review of the literature on the quality of care; convened a communications workshop to identify strategies for raising the awareness of the general public and key stakeholders of quality concerns; identified environmental forces that encourage or impede efforts to improve quality; developed strategies for fostering greater accountability for quality; and identified important areas of research that should be pursued to facilitate improvements in quality. Effective: providing services based on scientific knowledge to all who could benefit and refraining from providing services to those not likely to benefit (avoiding underuse and overuse, respectively). In an effort to define quality cancer care, the Cancer Quality Alliance (CQA), a national alliance advocating for improvements in the quality of cancer care co-chaired by leaders from the National Coalition for Cancer Survivorship and the American Society for Clinical Oncology, has developed a set of five cancer case studies that present examples of “best case” and “worst case” scenarios in cancer care. Together, the scenarios represent a “Blueprint” for action needed to achieve the best possible cancer care. Published in the September/October issue of CA: A Cancer Journal of Clinicians, “Blueprint for Quality Cancer Care,” highlights examples of system failures that can occur in real life when treating people with cancer, interventions to overcome these failures, and action steps to achieve “best case” care. The “Blueprint” will be made available for use as a teaching tool for health care providers and patients, laying the groundwork for creating quality cancer care in this country by demonstrating how the health care system should work to benefit any person living with, through, and beyond a cancer diagnosis.